After the Rangers' practiced Monday, coach John Tortorella hinted that captain's Chris Drury's status for Game 1 was iffy at best. Drury didn't skate for the fourth day in a row with an undisclosed injury. Well, he was on the ice Tuesday and said he felt good. It would be shocking if Drury doesn't skate in Game 1 Wednesday night at the Verizon Center. "Clearly this is the best time of the year," Drury said. "Spring hockey, playoff hockey, this is what you work all year to get to. Hopefully I'll even feel better (Wednesday) and we'll go from there." Tortorella said Drury "looked fine" in practice, but he still labeled the captain's status as "day to day." Still, it was good to get him back on the ice a day before Game 1. "He's been off for a few days and the player always needs to get back on the ice before a series starts," Tortorella said. "Practicing at this time of the year and practicing throughout the series is not an important thing, but Chris has been off for a few days here and I think it helped him to get on. I think the rest helped him." Asked if there was any chance that he wouldn't play Wednesday night, Drury said, "I don't even really want to think about that." At least three goals per game and probably more? Check. A power play that is successful more than 13.9 percent of the time? You bet. All aspects are of the utmost importance, and all can be on their side, the Rangers say, if they win the puck possession game, which is paramount against a team like the Capitals. "Obviously they are loaded with talent and with guys that like to have the puck and do things offensively with the puck," Rangers captain Chris Drury said following Tuesday's practice, the team's final tune-up before leaving for D.C. "I mean, how many shots did (Alex) Ovechkin end up with this year (528) and how many did our leading shot guy have (Scott Gomez, 271)? He doubled us. The puck is important against every team, and certainly versus them." It may seem that the best approach for the Rangers if they plan on taming snipers like Ovechkin (56 goals), Alexander Semin (34 goals) and Mike Green (31 goals) is to play a defensive game, similar to how they played under former coach Tom Renney. Not so, they say. Not so at all. The more they attack, which is Tortorella's style, the better chance they have. That's why, forward Blair Betts said, the Rangers have spent so much time lately practicing puck possession. Remember, while they scored only 2.44 goals per game during the regular season (good for 28th in the NHL), the Capitals allowed 2.93, which was 19th in the League. "I think if you sit back against a team like that you're constantly defending some really great players," Betts told NHL.com. "The best game plan for us would be to try to make their best players play defense. If you're just concentrating too much on defending you're going to constantly be defending and that's probably what they want. "The more we can make their players play in their own end, maybe they won't have enough gas to play offense." Sounds like a plan, but don't try to get any pertinent information as to matchups, game-planning and the like out of Tortorella. It could be head games or just secrecy, but all Tortorella would say about puck possession is it's important against any team. 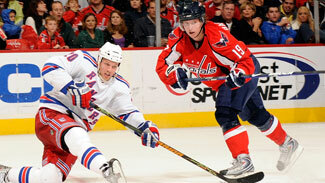 That it's Ovechkin and the Capitals shouldn't have any bearing on how the Rangers play. "The team that is most effective with the puck has a better chance of winning," Tortorella said. 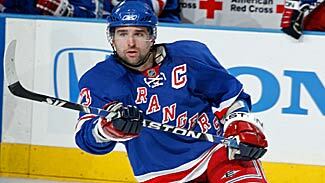 "It's not so much against Washington, it's something we concentrate on in our effort as the New York Rangers. Hopefully we'll do a little bit of that and see if we can score some goals along the way." Yeah, that would help. The Rangers had the 28th best offense in the 30-team League this season and did not have anybody score 30 goals. Their leading goal scorer, Nik Antropov (28), did most of his damage with the Toronto Maple Leafs before the trade deadline. The Capitals have one 50-goal scorer and two more who potted 30, including Green, who broke an NHL record for defensemen this season by scoring in eight-straight games. Green poses a problem for any team with his ability to join the rush and fire the puck. He's someone the Rangers' forwards simply can't lose sight of. "You certainly have to know where he is as a winger and as a center," Drury said. "He's looking to jump as soon as he can, so you have to be aware of him." To slow Green down, especially on the counter attack, Rangers defenseman Derek Morris said the forwards have to get in his way to disrupt his rush. "It doesn't have to be a real big hit, but our forwards have to do a good job of just bumping into him to stop him from getting up in the rush," Morris said. Communication is also important, and even Lundqvist said he needs to do more talking to make sure the five skaters in front of him are aware of Green's whereabouts at all times. They won't lose Ovechkin because he's omnipresent in the zone, but Green does a lot of his damage because the opposition is always trying to hound Ovechkin. "I try to help when I can," Lundqvist said in regards to communication. "Sometimes I forget to talk because I'm so focused on the game. That's something I can be a little bit better at." He won't have to be if the Rangers establish the puck possession game. "We're going to play, that's all," Tortorella said. "I'm not going to get into a long dissertation about the other team. We're trying to prepare our team and we're looking forward to it. Enough practicing. Enough of the regular season. It's time to play."